You wouldn't expect uniformity amongst the rooms of such a venerable old coaching inn as the Crown and Thistle. And, being truthful, this notable Abingdon establishment is as far from bland corporate-chain accommodation as you will find, with 18 individually decorated doubles and twins, many complete with original period features. 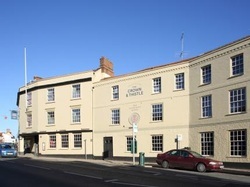 The hotel itself is actually made up of a number of individual buildings with its Grade II listing suggesting that the core dates from circa 1605, while the curved front elevation dates from the 18th century. Stay here and you'll be following in the footsteps of a fair few notable figures. Margaret Thatcher came her during her days at Oxford University, as indeed did the future King Edward VII while studying at Christ Church College as Prince of Wales. The actor Douglas Fairbanks Jnr also partook of its hospitality while in England, later writing a postcard to the landlord from the set of Gunga Din in 1938: “This is a far cry from Abingdon – so wish I were on the “Grateful” now and could drop in for the night. Have you any new pin-tables? Yours D Fairbanks Jr”. However, its most notable historic claim-to-fame is that the Victorian art critic and philanthropist John Ruskin had his own room on the top floor of the Crown and Thistle. Indeed, he seemed to have used it as something of a home until 1875, even having a kennel for his dog, Camille.